How Will Global Trends Affect You? Innovations in communication, production and packaging are revolutionizing the agriculture industry. Combined with the dramatic increase in need for safe, plentiful food, today’s agriculture professionals must navigate the challenges of a “Globally Local” World. NAMA’s 2010 Trends in Agriculture conference, October 5-6, in Minneapolis, will help you stay ahead of the curve and gain an edge in the rapidly changing landscape of our global agriculture market. Registration for Trends In Agriculture is now open, so register today at http://www.nama.org/ConferenceRegistration/Default.aspx?confid=23. For session descriptions and hotel information please visit http://www.nama.org/trends/index.htm. Get the recognition your company deserves by becoming a sponsor of the 2010 Trends In Agriculture conference, October 5-6, in Minneapolis. – Recognition in the program booklet, and from the podium during the session. – Recognition by signage at the sponsored event (if applicable). – Recognition in post-Trends articles in Agri Marketing magazine and media releases. – Recognition on the NAMA Trends In Agriculture web site page. To sign up for a sponsorship opportunity, fill out the On-line Sponsorship Form or contact Jenny Pickett at 913-491-6500 or via e-mail at jennyp@nama.org. Watch the Call for Entries for our new category, the Producer’s Choice Award. In this category, you’ll be able to enter a single page ad that will be judged by 1,000-2,000 producers. This category is made possible by Successful Farming & Agriculture Online and Readex Research. The Best of NAMA Call for Entries will be available on the NAMA web site at the end of August and will be mailed by September 1. All entries must be received in the NAMA Office by Friday, October 8, 2010. The Best of NAMA awards program honors the best work in agricultural communications. Actually, the best of the best, since companies/agencies must first qualify through regional competition in order to advance to the national level. The national awards ceremony will take place April 13, at the Hyatt Regency Crown Center in Kansas City. Best of NAMA operates on a regional judging format. Entries are sent directly to the national NAMA office and judged by industry professionals at a regional level for possible advancement to national competition. A minimum point standard will be used at the regional level. If you place first or merit at the regional competition and score above the minimum point standard, you are eligible to advance to the national competition. Stay tuned to your email inbox for notification of the Call for Entries on the NAMA web site! The Indiana State Fair was the site of Mid-America NAMA’s August 10 reception. Those who attended were thankful that the chapter chose the Farm Bureau Building, the only air conditioned building on Fair grounds, for the reception. It was a welcome reprieve from the nearly 100˚ heat. In addition to members from Purdue University, Wabash, IN, and the surrounding area, chapter leaders also welcomed several visitors from the Badger Chapter. There’s still time to register for the NAMA Boot Camp, August 17-19, 2010, at the Hyatt Regency Crown Center in Kansas City. Check out the program below and get registered today! Kick off the Boot Camp with a networking activity designed to help you get to know fellow attendees. Learn how to communicate effectively with producers. The producer panel has become a Boot Camp favorite and attendees won’t want to miss the valuable insights from producers. The panel will be moderated by Janelle Buxton, Sales Executive, Successful Farming and Agriculture Online. Three producers will be joining Janelle to share their insights. Little Red Writing Hood ~ Beth Burgy, Broadhead + Co. The client has asked you to write a communications plan. Don’t despair! Developing a communications plan with concrete objectives, strategies and tactics is a lot like planning a trip in the land of fractured fairy tales. You have to know where you’re going, how you’re going to get there and what to expect when you arrive. This session will provide some useful hints to give you the upper hand in the plan development process. Do you market to the animal health industry? This session is a great way to get two perspectives on the best way to reach that market. Hear from the company side and from the producer side. You will walk away with great insights into the animal health arena. ABM’s Agri Council and Readex Research have joined forces to conduct a major agricultural research study that explores the impact of digital media on farmers and ranchers. Its findings are based on the responses of more than 1,200 owners, operators, and/or managers of farms or ranches. Jack Semler, president of Readex Research, will be presenting a summary of key findings from this important market research. Do you market to the row crop industry? This session is a great way to get two perspectives on the best way to reach that market. Hear from the company side and from the producer side. You will walk away with great insights into the row crop industry. Every organization will eventually face the “moment of truth” when something goes wrong affecting your people, products or reputation. Public relations and marketing professionals play a critical role in managing communications during a crisis which can affect the outcome for better or worse. This session will offer practical tips for managing a crisis before, during and after the moment of truth based on the real-life experiences of an ag communicator who has helped manage product recalls, oil spills and the media onslaught that accompanies a crisis. Daren Williams is executive director of communications at the National Cattlemen’s Beef Association and former senior vice president of Fleishman-Hillard, Inc., where he specialized in crisis communications for clients in the food, agriculture and health care industries. All boot camp attendees will be together for this last session of the day to hear from an Ag Retailer and a Large Animal Vet. Learn their perspective on the business. A shuttle will take attendees to a special reception at Kansas City’s own Boulevard Brewery. Founded in 1989, Boulevard Brewing Company has grown to become the largest specialty brewer in the Midwest. The reception will take place in the beautiful Heim Room that features a unique view of the Kansas City skyline. Attendees can attend an optional dine-around. This is a great way to get to know your peers and learn about NAMA. This event is optional and dutch treat. Learn how to do the best possible job for your employer and enhance your career. 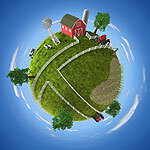 There is a distance between most Americans and the farms that produce their food. It is a gap being filled more and more by detractors that have farmers and big agribusiness as the enemy. Producers, their suppliers and the ag industry are trying to raise awareness of the truth about American agriculture. Join these panel members as we examine what we can all do to advocate for our industry. Please note: The Hyatt Regency is sold out on August 16 & 17. If you are in need of a room at the Hyatt, please contact Kathi Conrad at 913-491-6500 or at kathic@nama.org. For more information on the NAMA Boot Camp, visit http://www.nama.org/programs/index.html. To register for the NAMA Boot Camp and/or the MoKan Ag Tour, please visit http://www.nama.org/ConferenceRegistration/Default.aspx?confid=22. Register today for the 2010 MoKan Ag Tour on Tuesday, August 17, prior to the NAMA Boot Camp. The tour is an on-farm experience where attendees will tour as well as learn about different operations. The morning begins with a tour of an Ag Retailer, who is an aerial applicator, to check out the plane/equipment. There will be a short presentation from the pilot. The group will visit a rural meat market and will tour a 20,000 acre row crop facility as well as a livestock operation. 11:00 a.m. Tour Pence Aerial Service, an Aerial Applicator’s Operation at the Carrollton Airport (including plane) and discussion about what Aerial Applicators do for Agriculture and what the National Agriculture Aviation Association does to promote safety and stewardship. Cost for the MoKan Ag Tour is $50 and includes a boxed breakfast & lunch as well as beverages. To register for the MoKan Ag Tour, visit http://www.nama.org/ConferenceRegistration/Default.aspx?confid=22. Doane Advisory’s 26th annual conference is scheduled for October 18th & 19th at the Embassy Suites in St. Louis, Missouri. The speakers will include experts from the Federal Reserve, High Quest Partners, Confluence Investment, and Doane Advisory. In additional, a panel of crop consultants will give a “from the field” perspective. NAMA members can register for just $400 – that’s a $100 discount off the normal registration cost. Visit www.doane.com/outlook2010 to view the entire agenda and register. Please put NAMA member in the comments section for the discount. Mark your calendars for the 2010 Trends In Agriculture fall meeting, October 5-6 at The Marquette in Minneapolis, MN. Programming for the fall Trends meeting is underway and more information on sessions will be available soon! If you are interested in sponsoring a session at the 2010 Trends In Agriculture meeting, please contact Jenny Pickett at 913-491-6500 or at jennyp@nama.org. The deadline for submitting entries for the Best of NAMA competition is Friday, October 8. The Best of NAMA awards program honors the best work in agricultural communications. Actually, the best of the best, since companies/agencies must first qualify through regional competition in order to advance to the national level. The national awards ceremony will take place April 13, at the Hyatt Regency, Kansas City. More information on the Best of NAMA Call for Entries is on the way! The NAMA Executive Committee will be meeting this week in Lake Tahoe, California. Kevin Ochsner, Adayana, Inc., will be joining the Executive Committee to help committee members establish NAMA’s strategic plan. The meeting will take place August 4-5. Executive Committee members include: Susie Decker, Farm Progress Companies (National NAMA President); Vicki Henrickson, Blasdel Cleaver Schwalbe Communications (President-Elect); Beth Burgy, Broadhead + Co. (Secretary/Treasurer); Paul Redhage, FMC Agricultural Products; Kenna Rathai, Kenna B. Rathai Communications; Robert Ratliff, ProfitableFarming.com; Ken Dean, SouthWestern Association/Western Farm Show; Marvin Kokes, National Cattlemen’s Beef Association; Becky Peterson, Farm Credit Services; and Jenny Pickett, National NAMA. 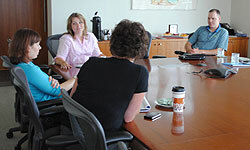 The Careers Committee will meet August 27 at the Rhea + Kaiser Marketing Communications offices in Naperville, IL. The committee will be discussing the responsibilities of the committee as well as any Marketing Competition Guideline changes and planning for the Student Marketing Competition at the 2011 Agri-Marketing Conference, April 13-15, 2011. The Careers Committee includes: Wes Meador, Rhea + Kaiser Marketing Communications (Careers Chair); Kristen Marshall, Nicholson Kovac (Vice Chair); Stacey Noe, Iowa State University (Advisor); Jennifer Christie, John Deere, Ltd. & Student Advisor for University of Guelph; Deron Johnson, Rhea + Kaiser Marketing Communications; Michelle Tollefson, Pfizer Animal Health; Matt Bornhorst, Agriculture Future of America; Mike Butler, Archer>Malmo; Amy Barron, Novus International; Janelle Buxton, Successful Farming & Agriculture Online; Sara Thieding, Makhteshim Agan of North America; Jill Loehr, Wyffels Hybrids; Carrie Jorgensen, McCormick Company; Amy Jolliff, Bader Rutter & Associates; and Paul Redhage, FMC Agriculture Products (Executive Committee Liaison). Several of the North Central Chapter’s leaders (Sheri Hansen, Padilla Speer Beardsley; Josh Krenz, Land O’Lakes, Inc.; Lori Maude, Broadhead + Co.; Teri Otte, Land O’Lakes, Inc.; Melissa Richard, Padilla Speer Beardsley; and JoDee George, Weber Shandwick) met at the Padilla Speer Beardsley offices on Thursday, July 22 to plan the upcoming chapter year. By the end of the morning, topics had been chosen and responsibility of each assigned to specific leaders. Chapter members can look forward to a variety of programs, including generational issues, crisis communication, legislative updates and another fun night at a Twins game. In addition, the North Central Chapter will host a reception at the closing of NAMA’s Trends in Agriculture Conference, being held at The Marquette Hotel in Minneapolis on October 5 and 6.